Book your flight on any domestic carrier – SAA, BA, Mango, Kulula, Fly Safair – and you will collect up to 40%* back in rewards points. 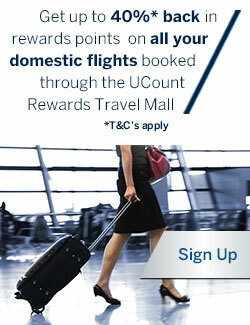 All you have to do is make your booking through the UCount Rewards Travel Mall and pay with your qualifying Standard Bank Business card. You can book accommodation at a range of hotels, guest houses and B ’n B’s around the world at specially negotiated rates. You can also take advantage of a range of local and international travel packages and collect up to 1.25% back in rewards points when you use your qualifying card to pay. 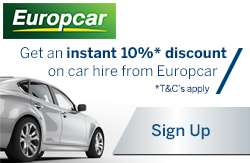 An instant 10%*discount from Europcar! Remember: you will also collect points on all your car hire spend when you use your qualifying Standard Bank Business card to pay. When you buy foreign currency through your Business Banking transactional account, you will collect additional tiering points. Purchase Forex to the value of R7 500 or more in any 12-month period and you’ll collect 50 tiering points and potentially move up a tier. You can purchase your Foreign currency from a Standard Bank Forex branch – either in Foreign notes or you can have your currency loaded on to a secure prepaid Master Card Travel Wallet card. Alternatively, you can order your Forex online using our Direct Delivery service, and we will deliver the Forex directly to your business premises within 24 hours. 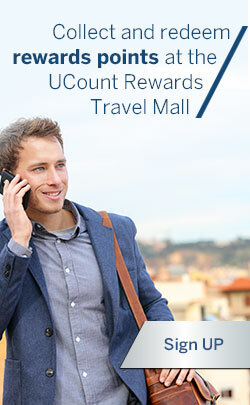 *IMPORTANT NOTE: All bookings must be made online at the UCount Rewards Travel Mall in order to qualify for the 40%* back in rewards points. Only the Transactor (the signatory who registered on the business’s behalf) may manage the account and redeem rewards points for flights, car hire, hotel accommodation and travel packages. When redeeming rewards points, the Transactor of the account has the option to make bookings on behalf of other members of the business. Get an instant 10% discount from Europcar!